I am looking into this and see Ian Fritz, October 2010 article and Ray's MFOS article, Transistor Matching 101 under the Synth-DIY 101 tab within his website. The MFOS shows a little circuit and a larger GO no GO circuit. Has anyone made up one of these? If using Ian's how do you swap the emitter leads easily. Setting up a switch perhaps? Does anyone have some images of their testing bread board setup? Or better suggestions than these two examples? I would like to see what other people are doing to match their transistors. 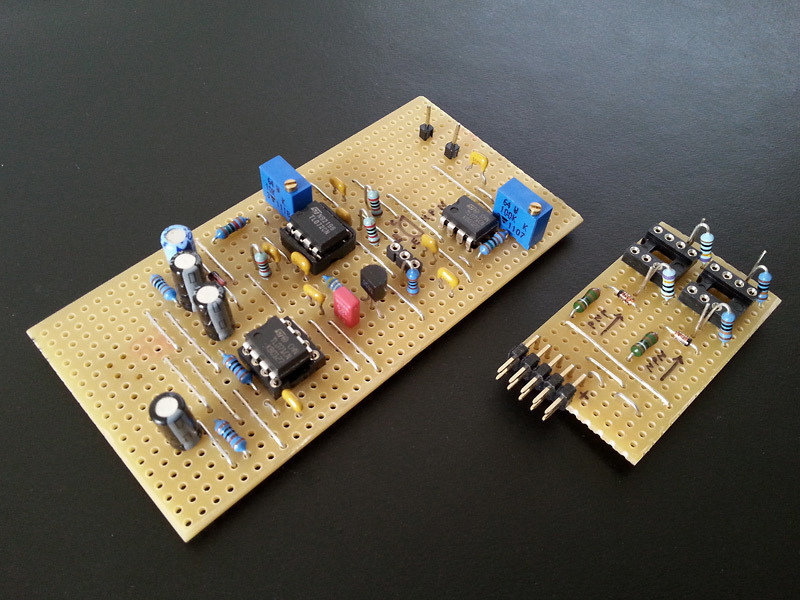 I built both on stripboard, the simple MFOS and Ian's. Both work fine, but Ian's is a lot simpler to build. 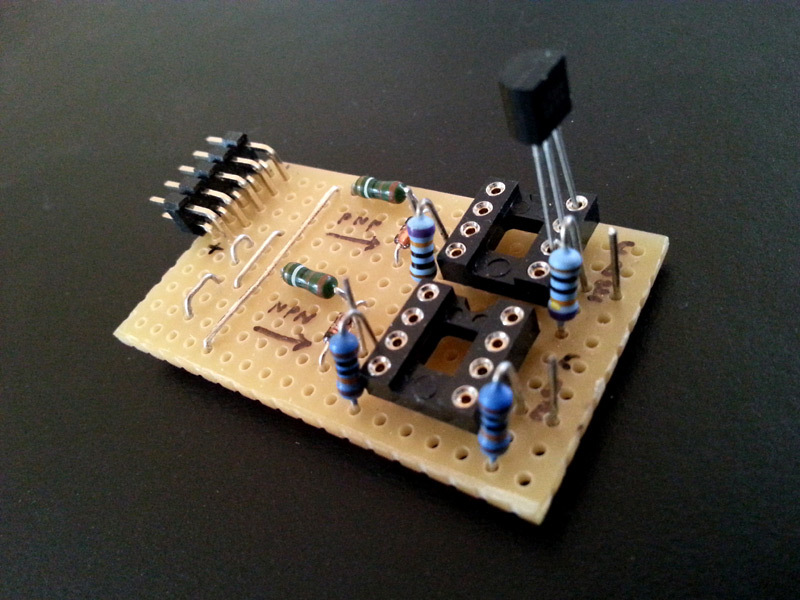 I had built a noise module with a socket for the noise source (transistor) some time ago. However, the transistor didn't made sufficent contact to make it feasible. Roglok: so you used the 8-pin IC sockets for the transistors? How do the E-C-B pins of a transistor plug in? You might check to see if the Ray Wilson circuit has the same flaw that the Moog schematic has. That is there needs to be a 10K resistor between the collector and emitter of the transistors in the PNP tester like the NPN one has. Also keep in mind those sockets don't have a lot of insertion cycles. Might want to stack them 2-3 high and replace them as they wear out. That's a lot easier than having to unsolder and replace the one on the board. I have Ian's circuit permanently assigned to a small bread-board. Seems to do the trick quite nicely. I now only use monolithic matched pairs on rare occasions. I typically match them into groups, (by writing the values down and then grouping them by that) so I end up with maybe 5-6 good pairs after maybe 15-20 minutes of testing. That goes a fairly long way. Here's another version of MFOS Vbe matching tool: http://midisizer.com/vbe-matching, I still have a couple of spare pcbs. I breadboarded Ian's when i wanted matched transistors for for CGS DUSG's. I get close to 2 octaves in tune once i've got them trimmed correctly. I'm not sure what sort of tuning to expect with unmatched transistors, but i'm pretty happy. 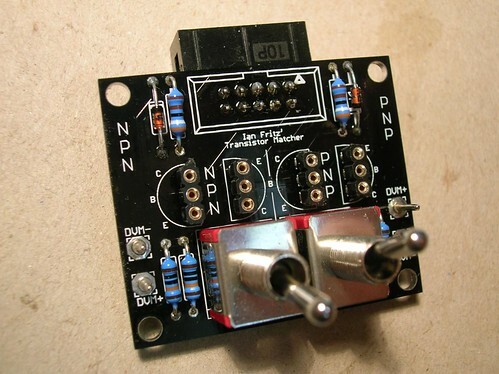 okay, while the MFOS circuit is called 'simple', Ian Fritz' circuit really IS simple. and there is no need for a precise voltage supply or matched resistors. Would you like to share your layout? the eagle files, you mean? i would/could ask ian. Yes, that would be good. Or just the SCH. I am guessing you set up the switch to swap the "e" and would like to see that part. A toner layout would even be better but I see that is asking a bit ++. and small !!! Will have to mount it to a panel . That is nice! I'd much prefer to use that over my breadboarded version. It would be cool to make a "Builder's Utility Module" that contained this, a tuning calibrator for 1V/Oct and maybe 1.2V/Oct, and maybe some peak level indicators or something along those lines. Of course, no problem. It's not like some clever invention, after all, basically just a Wheatstone bridge. An A440 reference tone in this module would be good too!